As a child I used to find counting the 199 steps up to Whitby Abbey on England’s east coast quite a thrill, trying not to rest on the levels created for gasping coffin bearers. 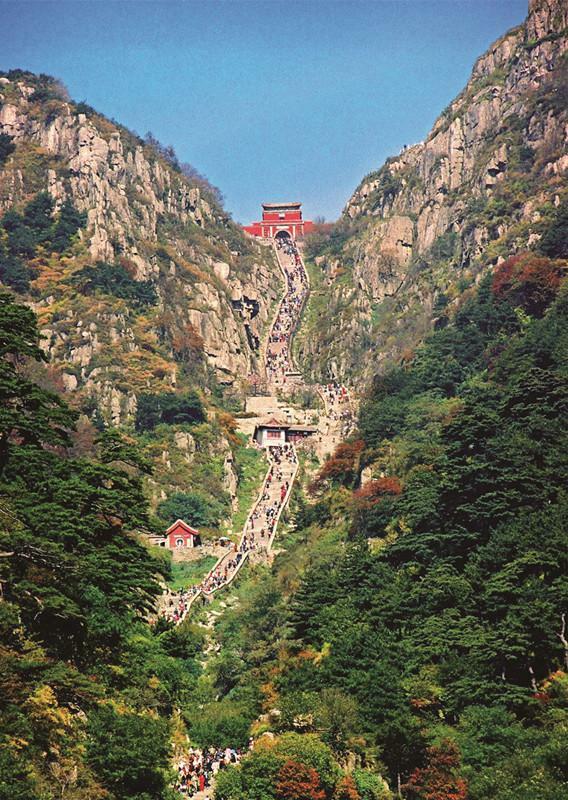 China scale adds another 7,000 steps, but perhaps the bigger East/West difference is that rather than there just being a religious site or building at the summit, it is the mountain itself that is the deity – with some temples on top for good measure. That fact that thousands of stairs, buildings and cable car systems have been cut into the rocky god seems not to matter. Taishan is the holiest of China’s five Taoist mountains (Wuyue) and the most important for imperial ceremonies. It has been worshipped throughout recorded Chinese history and is also referred to as the Eastern Yue (Dongyue) and Daishan. Starting as places where gods lived, the Wuyue became sites for emperors to go and perform rituals, especially from the Han dynasty onwards. In the Tang dynasty the mountains were given the title of “Kings” which was upgraded to “Emperors” in the Song and then “Gods” in the Ming. Despite the hidden speakers playing music and hawkers selling selfie-sticks, Taishan is still the same mountain where Great-Wall-building, book-burning Qin Shi Huangdi (259-210BC), the first self-styled emperor of “China” came to perform feng and shan rituals. Sometimes translated as “Worshipping Heaven and Earth,” the sacrifices had been performed by kings and emperors since the Zhou, but Qin Shi Huangdi did them the most lavishly. He had roads built up and to ease his route of paying tribute and making sacrifices before surveying his empire from the summit. Inscriptions of his rituals were carved into the mountain itself. 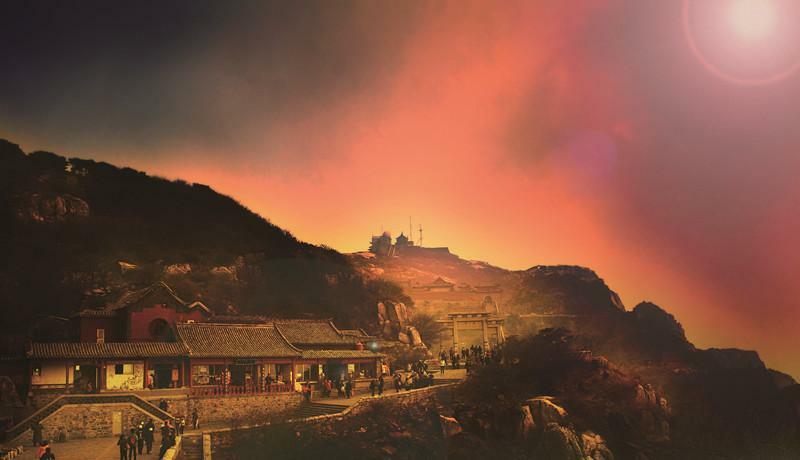 Subsequent emperors performed the rites at the Daimiao temple near the entrance to the Taishan Park area, which itself makes a pleasant trip before or after one’s assault on the mountain. What seems to have happened since is more a Controlling of Heaven and Earth as, for all intents and purposes the mountain is now a fully-equipped tourist attraction, though you will spot pilgrims of varying levels of authenticity climbing their way up. Busy days see more than 10,000 tourists getting to the top one way or other, making the main drag feel less of a religious journey and more of a vertical train station. However, the temple complexes along the way and at the top and the mountain itself still overpower the crowds for overall majesty, plus the side paths to waterfalls and bridges allow weary climbers to grab moments of Daoist retreat. Ascending the eastern route, after a deceptively gentle start through woodland, the sites begin to appear on either side as well as above and below. Even the names are a joy: Shrine of the Blue Dawn, Abandoning Oneself Cliff (later renamed Treasure Life Cliff in a moment of Ming Dynasty political correctness), Hornless Dragon Pool, Combing and Washing River, Cloud Stepping Bridge, Teapot Sky Pavilion and Archway to Immortality. All in all, as a tribute to the Earth, architecture, historic continuity, perseverance and control and subjugation of nature, Taishan encapsulates millennia of tradition tempered with contemporary sight-seeing liveliness. Plus never have I been more grateful for other tourists wanting me to appear in their photos, providing frequent breaks. As a foreigner I was cut a lot of slack and declared very fit throughout my ascent and even offered restorative cigarettes. It was in fact a great way to meet people from all over China as everyone has the same goal of simply putting one foot in front of another up the 8km-long stairway hewn through and around the 1,500 meter peak. And the best thing about it? Knowing I’ll live to 100, as will all who climb Taishan, according to Shandong tradition.